Food from the Heart, originally Project Food Chain, started as a grassroots organization in 1994 feeding clients suffering from HIV/AIDS. Food was delivered to these clients free of charge every Wednesday. Project Food Chain evolved into Food From the Heart a few years later serving any home-bound individual suffering from any illness. They became a 501 (c)(3) organization in July of 2003. 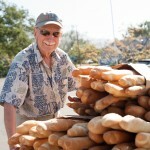 Their purpose is to prepare and deliver meals for individuals in our community facing a health crisis in their lives. They cook nutritious, well balanced meals and provide this food free of charge on a weekly basis to those with a genuine need. They run an efficient, cost effective program and are the only organization in the Santa Barbara-Goleta area that maintains this kind of free service each week for clients either in short term or long term health crises. They have over 75 dedicated volunteers who come weekly to harvest fruit, prepare and package food, deliver and sit and visit with clients. Their clients are referred to them via agencies in town such as Hospice, Cancer Center, CAC, Rehab Center, Dialysis Center and Cottage Hospital. 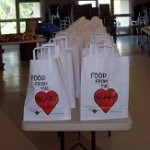 They deliver freshly prepared meal bags (approximately 5 days worth of food) to 150 clients per week. 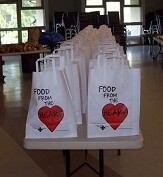 Each bag contains soup, 2 entrees, 1 salad, 1 casserole, sandwich toppings, dessert, bread and fruit. They do their good works with the help of community involvement such as the donation of kitchen and fellowship hall space from Trinity Lutheran Church, donations of fresh fruit and vegetables from local orchards and farms, bread that is donated each week from Our Daily Bread and Panera Bread as well as donations from people and businesses in our community. supplying food to the Warming Shelters, sharing freshly harvested fruit each week with Grace Lutheran’s Food Pantry, Organic Soup Kitchen, United Boys and Girls Club, Friendship Center, Domestic Violence Solutions and Community Kitchen. 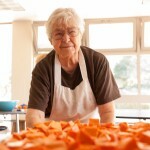 Food from the Heart Welcomes volunteers any Monday or Tuesday morning between 8:30-11:00 to help chop and prep food and Wednesdays between 8:30-12:30 to prep and package food with deliveries happening after 12:30. If you would like to volunteer email Kelly Onnen seekonnen@cox.net or call her at 805-451-7174.